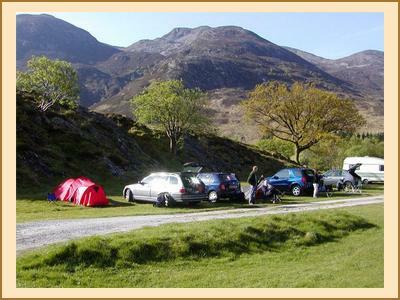 This was a new campsite for the club, set peacefully on the south shores of Loch Leven, and about equidistant from Glencoe village and Kinlochleven. A hastily arranged change from the scheduled camping meet, (Loch Morlich was closed for refurbishment) it proved to be a good replacement choice, with more than adequate facilities, and very reasonably priced. Nine club members attended the weekend, with those who arrived early providing an aperitif for the first midges of the summer season. Midge nets and insect repellent worked OK but we decided to visit the pub in Glencoe anyway, with Anne C kindly offering to drive us in her new 4*4. On our return the others were enjoying a beer or three 'al fresco' in the evening shadows of the Mamore hills and Kenny and Alison C's new dome tent, named Binnein Mor. A cool Friday night heralded in a cracker of a day on Saturday with more or less continuous warm sunshine and very light winds, It was clearly a day for ambitious plans to come to fruition. Alison W and Anne C had a big day in the Mamores, starting at the western end, taking in 5 Munros + other tops before time ran out. Lesley headed off for Loch Eil and a long walk in for a remote Corbett in beautiful Cona glen from Calop, returning late in the evening, whereas Owen opted for nearby Garbh Bheinn. With two weeks holiday ahead of him he was in no hurry to burn out on the first day. The rest, Alan and Anne R, Kenny, Alison C and Martin opted for a classic scramble on Ben Nevis, namely Castle ridge. This proved to be a demanding scramble, with fabulous exposure on the crux of the climb near the top and truly awesome views over adjacent buttresses and into still snow filled gullies. All difficulties on the climb were overcome without many problems and we were soon on the plateau and heading for the summit. The highest mountain in Scotland is not a place to be alone, especially on such a fantastic Spring day, and there must have been up to a hundred folk up there, soaking in the sunshine and 360 degree views to near and far distant hills and Islands. Sadly the rescue helicopter spotted from the Carn Mor Dearg Arete to the nearby Aonachs was on a real mission, and a fatality was later reported following a fall from one of the ridges. There was no desire to go to the pub on Saturday night after eating, instead we gathered in Binnein Mor with our camping chairs, beer and wine, and still had room to tuck in to Alison's cheese selection. The BBC forecast for Sunday was for low cloud and drizzle affecting all coasts and hills, so a long lie then, listening to the gentle rain patter on the tents. Well no. Another perfect morning actually with azure skies, but somewhat cooler and breezier. Anne and Alison W got a relatively early start, heading off for Stob Gabhar and Stob a' Choire Odhar in the Blackmount. The rest of us were more leisurely in our departures, enjoying the sunshine. 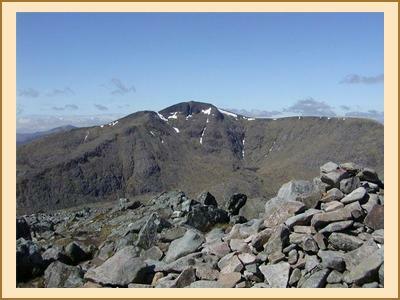 Alan planned a trip across Am Bodach and other Mamores to be met in Glen Nevis by Anne. Kenny and Alison were heading for the Coe and a climb there. Lesley headed for the Graham Beinn na Sroine from Glen Lochy. Owen had various hills in the Fort William area on his tick list. Martin finished the weekend off on the wee Buachaille Munros.